Browsing through the blogosphere recently, I came across an interesting little story about the scientific method, scientific progress, and un-scientific spin (h/t Hank Roberts). The subject concerns the polar ozone hole in Antarctica and a possible role for cosmic rays in its variability on solar cycle timescales. The proponents of this link are a small research group at the University of Sherbrooke in Canada, who find themselves up against the mainstream stratospheric chemistry community and whose ideas are twisted out of all recognition by the more foolish of the usual suspects. The story hit the ‘tubes earlier this year when researcher Q.B. Lu predicted that this years Antarctic ozone hole would be the biggest ever due to the actions of increased galactic cosmic rays (GCR) (because we are at solar minimum and GCR are inversely correlated to solar activity). This years peak ozone hole has now come and gone, and the prediction can therefore be evaluated. Unfortunately for Dr. Lu, this year’s hole was merely about average for the decade – a result that wasn’t too supportive for his theory. This story made me a little curious about this though. Firstly, I didn’t initially understand why cosmic rays should be playing a role in ozone depletion – most of the cosmic ray effects that are usually discussed revolve around cloud-aerosol connections, but there are not many clouds in the stratosphere where the ozone holes form, and the ones there are (Polar Stratospheric Clouds – PSCs) are much more sensitive to temperature and water vapour than they are likely to be to background aerosols. On further investigation, it turns out that this idea has been out there for a few years (and was reported on then) and has subsequently been discussed in the ozone literature. So let’s start with the background theory. Standard (Nobel-prize winning) stratospheric chemistry has tied ozone depletion to the increasing chlorine (Cl) load in the stratosphere which catalytically destroys ozone and comes from the photolytic dissolution of human-sourced chloro-fluoro-carbons (CFCs) high in the stratosphere. In the polar night, the presence of PSCs allows for a specific class of heterogeneous Cl reactions to occur on the surface of the cloud particles which turn out to be very efficient at destroying ozone. Hence the presence of an ozone hole in the very cold Antarctic polar vortex. Since PSCs are very sensitive to temperature, cold winter vortex conditions often presage a large ozone depletion the following spring (note that polar ozone depletion only occurs in sunlight and so is a spring time phenomena in both hemispheres). This is pretty much undisputed at this point (well, at least by serious scientists). We here at RealClimate even used this relationship to predict (successfully) a particularly large Arctic ozone depletion event in 2005. Dr. Lu’s theory though posits an additional mechanism to release the Cl from the CFCs – and that is through GCR effects. Specifically, Lu suggests that the action of the GCR on CFCs attached to PSCs causes more Cl to be released, thus potentially delivering more Cl exactly where it could enhance polar depletion most effectively. The evidence for this comes from correlations of ozone loss with GCR (over a couple of solar cycles) and some suggestive lab experiments. Note that this does not call into question the anthropogenic source of the Cl which is still from CFCs. However, Lu and colleagues’ theory has been strongly challenged in the literature. For instance, here, here and here. The comments focus on two main aspects, the weakness of the correlations (see figure), and the ancillary evidence that there isn’t any obvious evidence for CFC destruction in the polar vortex itself. In fact, correlations of CFCs with air mass tracers from the upper stratosphere are very stable, indicating that the photolytic conversion of the CFCs is by far the dominant source of Cl. These rebuttals seem quite compelling, and there doesn’t seem to be much continued support for Dr. Lu’s GCR idea. However, Lu is still pushing it (hence the press release this year just weeks before the prediction would be put to the test). One might think Dr. Lu’s ideas wrong, but one can’t fault his bravery in putting them to the test. As we stated above, the un-exceptional ozone loss this year pretty much undermines the correlations that were at the heart of Lu’s idea. Thus I predict that this is unlikely to be discussed very much more in the literature except as an example of how interesting ideas are generated, discussed, tested and (in this case) found wanting. This indeed is how scientific progress is made. Nurtured by environmental hysteria and the determination to show all changes in the natural world are due to human activity, the claim CFCs were destroying ozone jumped directly from an unproven hypothesis to a scientific fact. If the South Pole gets an ozone-hole maximum in the coming weeks, it will strengthen the case for cosmic rays, and endorse a Modern Warming driven by solar variations rather than human-emitted CO2. There is no pool so shallow that a thousand bloggers won’t drown in it. Nor an ozone hole it seems either. > Is that what they’re called!!! Yep, that was pointed out in and I gave you the term for it explicitly. Did you forget who you were? Dang. Maybe this Preview thingy isn’t a bad idea after all…. Well, I was young and impatient, and took a while to learn about online manners (at 300 baud). I can’t cast the first scone. I found too many possible papers to figure out your hint about the deep sea temperatures having been published. Author? References? full text, at some point? Is the idea warmth moving by conduction up through layers, or some magnetic induction that jumps past them? What’s the likely rate of change in temperature through the medium and the magnitude of the effect compared to what we know about CO2 currently? If that’s not addressed it’d be timely to weigh it. Why are you throwing cakes? Is this a Marie Antoinette thing? Nice post! Getting back to measurements… At NOAA’s Earth System Research Laboratory (NOAA/ESRL) many of the ozone depleting substances (ODS) have been measured in the troposphere for a couple of decades (i.e. CFC-11, CFC-12, CCl4,…). We have increased our global monitoring efforts over the years by extending our measurement programs to more sites and compounds (CH3Br, CH3Cl, halons, HCFCs, HFCs, etc). But can we address questions like… Are the ozone-destroying chemicals declining in the atmosphere? When do we expect the ozone hole above Antarctica to disappear? To tackle these types of questions NOAA/ESRL developed an Ozone Depleting Gas Index (ODGI). be expected, based on past data and future projections from international assessments. As of 2007 the ODGI was at 85.9 or down 14% since the Montreal Protocol and amendments were enacted. While the Montreal Protocol on Substances that Deplete the Ozone Layer must be considered a huge success and a model for future efforts to stem climate change, ozone layer recovery is expected only with sustained declines in atmospheric chlorine and bromine in future years and continued adherence to the production and consumption restrictions outlined in the Protocol. Recovery of the ozone layer is expected as the ODGI approaches zero, though the timing of complete ozone layer recovery is difficult to determine exactly because other chemical and physical factors such as climate change also influence stratospheric ozone abundances and the efficiency for chlorine and bromine to destroy stratospheric ozone. Scientist will argue over the details as to when the Ozone Layer will recovery — and how best to detect early signs of recovery. However, the chlorine and bromine in the stratosphere is still ~85% greater than before the ozone hole formed. #31: You can correlate the importation of bananas with the divorce rate in NYC, too, but that doesn’t mean there’s a cause-effect relationship. ¿Could someone explain me how this year is “merely about average for the decade” when it looks well over it? Oops. This isn’t a _change_ in reality, it’s a change in what we thought we knew about it. The Ball and Reber pages hang off there. Ah, fun in denialsville–this morning it was a gentleman (I presume) who was peddling the work of the good Herr Beck regarding atmospheric CO2–thanks to RC for the succinct critique of that incredible–and I do mean that literally!–piece of work–and claiming that the “political AGW movement” predated the science by at least a decade. If we count Fourier, I guess that would take anti-AGW activism right back to Napoleonic times! Nice to be part of a venerable tradition. . . but I wish we’d been able to get mitigation onto the table at the Congress of Vienna. The 1974 paper by Molina and Rowland in NATURE was published on June 28th. It coincided with a May 31st paper in SCIENCE by London and Kelley (http://www.sciencemag.org/cgi/content/abstract/184/4140/987) confirming an UPWARD trend in global total atmospheric ozone in the 1960s. What happened? The predicted and widely-publicized downward trend in global ozone was not apparent until the early 80s where a 4% depletion of ozone from 1979 to 1985 was clear. Panicky at the time, this “depletion” simply brought the average global ozone level back down to near 300 Dobson units — the same value London and Kelley gave for the late 60s. Then, from 1985 through 1990, in spite of a 25% increase in cumulative CFC-chlorine, global ozone remained virtually unchanged (Herman et al. J. Geophys. Res. 1991, Table 2). Their 1985-1990 global average was 301±2 DU. No NET global ozone depletion since the 1960s? None at all for six years running in the 80s? Strange results if CFCs are the cause and GLOBAL ozone depletion the effect, a connection that remains unproven to this day. Do other data support the CFC-Ozone theory? Molina and Rowland hypothesized that maximal ozone depletion from CFC destruction would take place in the middle stratosphere between 25 and 35 km, with negligible photodissociation of CFCs below 25 km. The catalytic ozone-destructive ClO molecules peak near 40 km with little or none present below 25 km. The inorganic chlorine below 25 km is HCl and CLONO2, both derived predominantly from non-CFCs (Zander et al., 1992, J. Atmos. Chem. 15, 171). Subsequent studies (Stolarski et al., 1992, SCIENCE, 256, 342) showed that the large decreases in ozone take place in the lower stratosphere, below 25 km. Nothing much in the follow-up data fits the theory very well. Neither did this theory work to explain the ozone hole which is why the esoteric heterogenous theory arose. Perhaps if Rowland, Molina and others had not ignored the research on the UPWARD trend in total ozone in the 60s (they were completely aware of this in 1975), and had not chosen to start the ozone-depletion scenario in 1978 with the first TOMS measurements from the Nimbus 7 satellite, the then-worrisome six-year downward trend might not have seemed so ominous and urgent to the public. CFCs would probably be less of an ozone depletion concern and more important as a greenhouse gas concern. The right result for the wrong reason? Stolarski, Richard S.; Bloomfield, Peter; McPeters, Richard D.; Herman, Jay R.
Geophysical Research Letters (1991), 18(6), 1015-8 CODEN: GPRLAJ; ISSN: 0094-8276. English. I find bits of that at junkscience and Marohasty but who threw it all together? Pointer please? By the way, Ken, you ought to cite the text that you’ve pasted in. “… environmental hysteria and the determination to show all changes in the natural world are due to human activity ….” and attributed that to Rowland, Molina and the other scientists in the field? Whoever wrote that deserves a proper citation and full credit. Reply 63. “The catalysis happens at the end of the polar night, temperature-dependent. It’s misleading to quote only “total global” measurements.” Of course, but I was referring to GLOBAL ozone depletion scenarios, not just the Antarctic polar region. What low-temperature chemistry happens in the seasonal polar vortex (the SIZE-AREA of which, of course, has nothing to do with CFCs) is irrelevant to the GLOBAL ozone picture. No evidence supports the theory that CFCs have had any lasting effect on stratospheric ozone outside of the Antarctic polar vortex. As I pointed out, the existing evidence does little or nothing to support this. Reply 64. Again, you are referring to the polar region, not the globe. Where are the DATA that CONFIRM the CFC chlorine GLOBAL ozone depletion theory as a “scientific fact”? Away from the Antarctic? Zip? For that, you’d have to understand the reason for the Nobel award, Ken. Where are you getting the stuff you’re posting? Read each actual paper, or even the abstract — compare that to the misstatements made about the paper in whatever you’re quoting. Look at the other papers from the same authors. That’s the problem quoting second hand blog stuff. Next talking point is: because there’s plenty of ozone at ground level, enough to be an air pollution problem, that proves there’s no deficiency of ozone on a global basis. Except use capslock more. Or — could it be PielkeJr? > in the 1960s. What happened? Well, note the size of the variation reported — very small compared to the amount of ozone loss observed from CFCs. Look at the citing articles (bottom of page) and you’ll find the answer to your question. He thought at the time we’d acted soon enough to avoid an Arctic ozone hole. He was wrong, we have had one for a while. Oh, but Hank, You’re taking the fun out of it for Ken. Complete citations are easier to debunk…not that this one is that tough. Chuckle. I’m guessing Ken credit was only fooled by a well done PR site. I don’t want to assume Ken created the selective quoting; it reads so much like one of the professional PR sites’ work. It’s not so terrible — once — to be copypasting from some PR site without checking the original sources. Once can happen to anybody. That’s why PR people are successful — what they do fools people. What’s important is to recognize PR, and don’t be fooled again. I have faith Ken, if he wants to, will develop the habit of always looking at the original papers and assessing whether what’s said about them makes sense. What he is probably doing is figuring out that the concern about “the globe” was based on business as usual scenarios, and that the question he copypasted — “Where are the DATA that CONFIRM the CFC chlorine GLOBAL ozone depletion theory as a “scientific fact”?” — is from the PR world, part of the spin used to deny the usefulness of basic scientific information in creating models and developing scenarios. Or, perhaps, he’s channeling Tim Ball. Time will tell. Weiss, R. F., J. Mühle, P. K. Salameh, and C. M. Harth (2008), Nitrogen trifluoride in the global atmosphere, Geophys. Res. Lett., 35, L20821, doi:10.1029/2008GL035913. 65: “By the way, Ken, you ought to cite the text that you’ve pasted in. The quote and it’s origin (Ball) is given in the article here under discussion…by gavin. See above. Fair question. Everything is from the peer-reviewed, primary scientific literature. Nothing from news media, editorials, other blogs, talk-show hosts or professional PR sites. Sounds fair, if you will do the same. Let’s look at some original papers that chronicle the UPWARD trend in global ozone prior to the Nimbus 7 TOMS measurements in 1978-79. Starting with London and Kelley (Science, 1974, vol. 184, p. 987-989) GLOBAL TRENDS IN TOTAL ATMOSPHERIC OZONE. Komhyr et al. (1971, Nature, vol. 232, p. 390-391) ATMOSPHERIC TOTAL OZONE INCREASE DURING THE 1960s. Komhyr et al. (1973, Pure and Applied Geophysics, vol. 106, p. 981-999) TOTAL OZONE INCREASE OVER NORTH AMERICA DURING THE 1960s. In 1979 London and Oltmans wrote THE GLOBAL DISTRIBUTION OF LONG-TERM TOTAL OZONE VARIATIONS DURING THE PERIOD 1957-1975. (Pure and Applied Geophysics, vol. 117, p. 345-354). In the abstract they write (in part): “It has been found that during the period 1961-70 the total ozone amount increased in the Northern Hemisphere by about 12 percent and that this increase seems significant at all latitudes.” Figures 2 and 3 in this paper illustrate the upward trend for both hemispheres at all latitudes, and for the globe. Then, in 1980 London wrote: THE OBSERVED DISTRIBUTION AND VARIATIONS OF TOTAL OZONE, pages 31-36 in Proceeding of the NATO Advanced Study Institute on Atmospheric Ozone: Its Variation and Human Influences, Algarve, Portugal, 1–13 Oct. 1979, Report No. FAA-EE-80-20. Figure 6 plots average annual variation of total ozone for the period 1958-1977 with reference lines for long term hemispheric and global averages. The line for global average crosses at 298.5 Dobson Units. Northern hemisphere: 301.8, Southern hemisphere 295.2. Conclusion? It is clear that an UPWARD trend in GLOBAL ozone was taking place prior to the Nimbus 7 TOMS measurements that began in 1978-79. The average global ozone was “about 300 DU” or 298.5 DU. Let’s compare these values with those from TOMS for the period 1979-1990. In post 62 I cited Herman et al., 1991. The complete citation is: Herman et al. Jour. Geophysical Res. vol. 96, p. 17,297-17305. GLOBAL AVERAGE OZONE CHANGE FROM NOVEMBER 1978 TO MAY 1990. Table 2 lists the global averages for each year from 1979 through 1990. The values from 79-85 are: 311.36, 309.06, 309.05, 307.28, 303.07, 303.83, 298.76. But, from 1986-1990: 300.76, 300.90, 301.19, 303.97, 298.83. All of these values can be checked and re-derived from the TOMS database put onto an EXCEL spreadsheet. Thus, a clear downward trend was seen from 1979 through 1985, but only to the very same point that was seen in the 58-77 atmosphere. In other words: No NET loss of global ozone from 1958 through 1985 and none at all from 1985 through 1990. (BTW, this is almost the “base period” for AGW studies). Where, then, is the ozone depletion that was supposedly caused by the megatons of CFCs released into the atmosphere? Suppose that the Molina-Rowland hypothesis had been published and tested beginning in 1965 when global ozone was below 295 DU instead of in 1979 when it was 311? Is this ozone depletion-CFC connection really a “scientific fact”? Well, it sure didn’t take long for the ad hominem comments to appear! Not a very scientific or adult rejoinder. Usually this device is reserved for those who have trouble with the message. Of course the dates were “cherry picked”. The point, which you avoided, is to show that unless 1979 is used as THE starting point (base period? ), there was no evidence of any actual decline in global ozone. That seems to be a fact. The evidence reveals that the 4% decline was not a net loss for the planet. 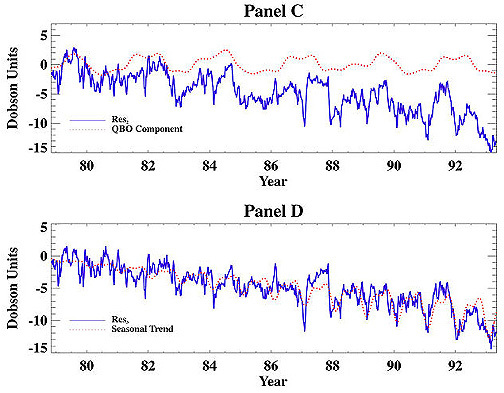 In 1985 the ozone in the atmosphere was back to where it was 25 years earlier. Studies of UVB showed no increases at ground level from 1974 to 1985 (Scotto et al., 1988, Science, v. 239, p. 762). Sounds VERY familiar, but where are the DATA, not just the assertions or the “due to” correlation between ozone and CFC destruction, that proves this case? Re-read post 55. What are the data that show the cause and effect? As I stated earlier, the depletions were found to take place below 25 km, not where the bulk of the ClO resides (~40 km). The photodissociation of CFCs is negligible below about 25 km. Below 25 km most of the Clx comes from the non-CFCs. Evidence for that? The HCl/HF ratio is 4 to 8-to-one. I wasn’t aware that data and assessments published before 1991 made them less valid. Might YOU be cherry-picking, by chance? But, again, you miss the point. The CFC-ozone theory was published in 1974 and the testing of it did not commence until 1979. Unless we specifically ignore the earlier data (which seems to have been done), by 1990 the test had failed. Global ozone had not really declined, long-term, and even after the much ballyhooed depletion in the early 80s nothing happened at all for the next six years. Ozone stood at the same place it was.. near 300 DU. Look at the data! In line with? Again, this is a correlation not a demonstrated cause-and-effect. Usually, when one shows a correlation, the first criticism is that it doesn’t imply cause and effect. Read post 55: “You can correlate the importation of bananas with the divorce rate in NYC, too, but that doesn’t mean there’s a cause-effect relationship.” How about a little more examination of and discussion of the data and a little less of the pseudo-skeptic put-downs? Ken, Excuse me, but I fail to see the ad hominem attack. Your argument was bogus, based on outdated research and cherry-picked results. And you chose to make this argument on a site run by experts in climate and atmospheric science. Now if you are going to charge a tank with a pea shooter, don’t be too surprised if the tank driver laughs at you. There are two possible responses to this: 1)Examine your tactics and your argument and see if maybe, just maybe you might not be misunderstanding the science just a wee bit. 2)Go back to whatever anti-science site you got this pail of fetid dingo’s kidneys from with your tail between your legs and whimper about those mean climate scientists. If you adopt strategy 1, your learning curve may have a positive slope. If you adopt strategy 2, we can look forward to your providing more entertainment in the future. I call that a win-win! Ken, you seem to be thinking like those who attack Darwin nowadays, or early work in any field where they don’t like the current science. It’s pointless. Look for newer science about the points you raise and you’ll find it easily. Example, just one, below. You can do better. “Founder” science can be important — the ozone/CFC work stands out, as Crutzen says. But it’s always improved on. First work wasn’t perfect. Nobody cares; it was interesting and productive of later work. … Rates of heterogeneous reactions are notoriously difficult to measure. Although their importance was discounted in assessments of the problem before the late 1980s (NAS 1984; WMO 1986), interest in their possible role persisted among some scientists (Sato and Rowland 1984), particularly in light of observations suggesting ozone loss at midlatitudes (Rowland 1989; 2006), and model simulations indicating that, with arbitrarily set rates, their effect on ozone could become quite large (Wuebbles and Connell 1984). Nevertheless, only the observation of the ozone hole forced a complete reassessment of the chemical scheme. The importance of heterogeneous chemistry was reinforced by subsequent identification of larger-than-expected depletion at midlatitutdes with an unpredicted seasonal and latitudinal pattern (WMO 1988) as well as observation of depletion in the Arctic (WMO 1991) and following volcanic eruptions (Hoffman and Solomon 1989). Taking this history as a whole, it is apparent that atmospheric observations and laboratory measurements led to key breakthroughs in theory and modelling. Some science historians have criticized the tendency to focus on “key” experiments or observations as the driving force behind revolutionary changes in science (Gilbert and Mulkay 1984). But in the case of ozone depletion, such a focus seems entirely justified. Furthermore, much of global change science shares the characteristics of the ozone problem that made a handful of observations critical to changes in theory: field measurements are sparse, and theory and models are often not well anchored. In analogy to the difficulty of measuring key intermediate atmospheric species in ozone chemistry (see above), key processes in other global change arenas, such as the ice sheets, cannot be determined due to a lack of detailed measurements in the right place at the right time, leaving models unconstrained. Furthermore, coordinated progress in measurement, observation and theory relies on bringing to bear expertise from multiple sub-specialties, a slow and difficult process (Christie 2001). In such situations, assessments can become inordinately dependent on projections of models that are validated across a limited range of experience. A broader set of tools, such as analysis of paleoclimate analogs, and a more comprehensive assessment of uncertainties (Moss and Schneider 2000) are required to provide policy makers with the fullest range of plausible outcomes. The fact that gradual improvement in some aspects of ozone photochemistry (Fig. 2) could cause a key outcome of modelling to diverge from the right answer demonstrates the difficulties that may arise in modelling complex problems with relatively simple representations (e.g., lacking heterogeneous chemistry) that capture only part of the physical reality. There are known uncertainties and still unknown uncertainties. The latter can be most important. See the full text, available as a PDF; link above. through reformation of ClONO2, then both reservoirs are produced concurrently but ClONO2 continues to significantly exceed HCl, and finally slow repartitioning between ClONO2 and HCl occurs; in 2005/2006, HCl and ClONO2 rise at comparable rates in some regions. In the Antarctic, chlorine deactivation proceeds in a similar manner in both winters, with a rapid rise in HCl accompanying the decrease in ClO….. Yes, there’s more to find out! We know the input (chlorofluorocarbons) and the observations (decline, on top of natural variation). The chemistry of exactly how it happens is in the details still being learned. Natural experiments like the one described above help bring out these details. That’s why new work is interesting. observed ozone losses at high latitudes, and, therefore, at least 60% of ozone destruction at the poles seems to be due to unknown mechanisms (Schiermeier 2007). In this regard, it was recently suggested that a chemical pathway involving a Cl2O2 isomer might be responsible. holes are formed. We suggest that other plausible mechanisms, which are closely associated with the extent of the interaction between gaseous species and solid particles, may be candidates for the justification of the missing ozone loss — to be experimentally investigated…. Gavin, in your response to #74, none of the three links seem to work. Barton, all three work for me (now and before); retry? gavin… Of course it exists! But, again, you (and the others) don’t seem to get the message. It’s the EARLIER data that were IGNORED…. data which you don’t want to acknowledge, or even discuss. The data are there; they exist. They are very relevant. Using what you now say is “short period noise” and what Post 76 now calls “outdated research” the science went from pure theory in 1974 to scientific fact in 1985 and on to legislative policy in 1992. Are you saying that this scientific fact was confirmed with selective, outdated noise? So far, you have not told us where the earlier data were wrong nor, more importantly, why they were ignored. Of course I acknowledge that more recent data exist. You haven’t shown where any of them answer the questions asked. What are “mid 20th century values”; where/how were they derived? Are they outdated? What is the evidence that they have anything to do, SPECIFICALLY, with CFCs? Cause and effect…remember? These are simple scientific questions. RE: The blizzard of graphs in the link that you trumpeted out support MY point. Except for Arosa (which is, of course, just one datum) all the other show trends beginning in 1978 or 1979. None of them shows the data and slopes from the earlier ozone measurements when ozone was lower. Where are those? Yes, I chose to present these arguments on a site run by experts because you ARE the experts. Posts elsewhere would certainly have received what I didn’t expect here from scientists…ad hominem, off-the-cuff, ignore-the-data, responses. I have presented you experts with what you initially asked for: real citations; real data, peer-reviewed papers, not some off-the-wall junk, of which I agree there is plenty. So far, it has been really disappointing. If you are experts, why not act like experts? In 1978 total ozone near a HISTORICAL MAXIMUM! So, if one begins a CFC-ozone depletion theory test in 1979 (which we did; see gavin’s charts) should it have been a surprise that ozone was “depleted” for a few years? 1979 was a very bad choice. That’s like using some Little-Ice-Age year as a base period for global warming studies; Can’t lose! Want to see some REAL cherry-picked results? Look at Bojkov et. al. (1995) Jour. Geophys. Res. vol. 100, p. 25,867-25,876. TOTAL OZONE TRENDS FROM QUALITY CONTROLLED GROUND-BASED DATA (1964-1994). So, we select (cherry-pick?) the data that are more likely to prove what we set out to prove? Surprise…level baseline followed by a negative slope. Prediction confirmed! BUT, if one uses the 1964-1992 data (which they had) the slope is LEVEL, and if one uses the 1957-1992 data the slope is positive. Now, that’s world-class cherry-picking! “Look for newer science”? “Nobody cares”? Hey, it’s data.. yes it’s “old” but valid unless shown clearly to be faulty. Have you done that? No…it has simply been ignored and called “founder science”! You haven’t told us where the “founder” data that “can be important” (and which I specifically referenced) was wrong. “Attack early work in any field where they don’t like the current science?” But isn’t it you who is attacking the early work, not me? You don’t seem to want to deal with the data…because it seems to show where the case for any CFC caused GLOBAL ozone depletion is a house of cards? As an expert, if I’m wrong, get SPECIFIC. After all, you claim to be the expert scientist. Is this what gavin (post 75) calls short period noise? If so, it was ignored and the noise was used to help promote a theory to an established fact? Who is in denial? More noise. Nobody cared? Seems like it. Miller et al. 1980, Nature, v. 288, pp. 461-464. TWO-DIMENSIONAL MODEL CALCULATIONS OF STRATOSPHERIC HCL AND CLO. The chemistry is indeed in the details! It simply doesn’t fit the global DATA. As I mentioned earlier, the Molina/Rowland hypothesis (Nature, 1974, v. 249, p. 811) told us that the maximum depletion would take place in the middle stratosphere “between 25 and 35 km” but, as I referenced, twice, ozone depletion was shown to be taking place BELOW 25 km. More to find out? Well, yes, the “standard” gas-phase theory could not, and does not, even explain the seasonal Antarctic ozone hole. Lots to find out. Susan Solomon (1990, Nature, vol. 347, p. 350) wrote this (although it was pre-1991…sorry gavin): “The model simulation neglecting heterogeneous chemistry is unable to reproduce the observed ClO profile…” In other words, the “standard chemistry” doesn’t work! Obviously,at 30° N latitude there are no PSCs nor –78 °C temperatures. Except for volcanic aerosols (El Chichon? Pinatubo? ), heterogeneous chemistry cannot explain ozone outside the ultracold polar vortex. Some more? Heath, D.F. (1988) Nature, v. 332, p. 219-227. NON-SEASONAL CHANGES IN TOTAL COLUMN OZONE FROM SATELLITE OBSERVATION, 1970-86. Or, how about this conclusion? Hill et al. 1977 Geophys. Res. Letters, v. 4, p. 21-24. ANALYZING WORLDWIDE TOTAL OZONE FOR TRENDS. So…please, provide the confirming data that show that the Cl, specifically from CFCs, has resulted in a NET long-term depletion of GLOBAL ozone. I have presented data from peer-reviewed publications that cast doubt on the GLOBAL CFC-ozone depletion scenario (and there is lots more). The polar situation is very localized, seasonal, and clearly different. Using the polar data as “proof” for the global condition is a bait-and-switch sales technique. This does not seem to be too much to ask of experts. If anthropogenic global ozone depletion is a scientific fact it should be a piece of cake to show where and why. Ken, of course nobody wanted to wait. Nobody considered it necessary to let the problem became global and year-round before taking action to prevent that from happening. No one has ever argued for increasing production of a highly stable long-lived chemical once it’s identified as biologically active or a chemical catalyst. Those are red flags. Nobody wants to accumulate damage before dealing with the obvious problem identified for anything of that sort. It would have been too late if people had waited. For that matter, it would have been too late even when the discovery was made and action taken, if the industry had used primarily bromine, rather than chlorine, to halogenate fluorocarbon compounds for market purposes. Close call, understand? Cautionary experience. You’re quoting from the people who did studies, but you’re spinning them like the PR people did for the industries that were badly wrong about what the studies meant. And, Ken, seriously — unless this is a “Darwin was wrong so evolution has no foundation” kind of approach you’re taking, go back and read the Crutzen speech I linked to and briefly excerpted above. You’re setting out the early work that was improved on and seem to be declaiming (or pasting from someone who did) that somehow because better research was possible meant there was no need to worry at the time. Is that your idea? Look again. See the words around this bit? Duh. Science works. That’s how. … By the time you’ve progressed to the point of general agreement — and all a consensus is is general agreement, not universal agreement — the point has dropped out of being live science. The science is in the parts we don’t understand well. That’s effectively part of the definition for doing science. …. I didn’t appreciate it properly at the time, but a sign on the chemistry department door in my college put it best: “If we knew what we were doing, it wouldn’t be science.” The live part of science involves learning new things. replacement hydrofluorocarbons (HFCs), are also potent global warming gases, often more destructive than the HCFCs they are replacing. Despite this, HFCs are widely marketed by the refrigeration industry as environmentally friendly. They have also been readily accepted as replacements to ozone depleting gases in many industrialised countries. As a result, scientists have found atmospheric concentrations of HFCs are increasing at such a rate that by 2015 their emissions will be over 1.2 billion tonnes of carbon dioxide equivalence (CO2-eq). This appears to place the Montreal Protocol directly at odds with the goals of the Kyoto Protocol, which controls emissions of global warming gases including HFCs. To the bystander, these treaties are heading ominously down very different roads. … last year’s milestone agreement could actually result in increased global green house gas emissions – and certainly we will not see anything like the 12-15 billion tonnes of CO2-eq savings being widely quoted by the United Nations. So far, the Kyoto Protocol has yet to wake up to the fact that HFC emissions are likely to continue rising considerably in the foreseeable future. …. And we know that ozone continued to rise from 1970 to 1979. So why did we pick 1979 to “test” this theory? Can you answer that, please? Would you accept that sort of thing for AGW studies? I don’t think so. This is absolutely true, but the polar results are, as I said, not applicable to the global condition because the heterogeneous chemistry they require simply doesn’t work in the midlatitudes outside of the polar region (except maybe during volcanic eruptions). Neither does the “standard” gas-phase chemistry work where the non-polar losses are seen. And, even the polar results do not explain why it is the halogens from CFCs (as opposed to those lacking fluorine) that are THE ones causing the seasonal losses. There were no CFCs in 1957-58 when the IGY people measured the temperatures in the Antarctic vortex at minus 80 degrees at 50 mb and ozone loss was seen. Please, gavin. I have never said there was any conspiracy. That would, indeed, be lunatic! But, look back. Your own “nice selection” of charts and graphs for global ozone (your response to my Post 74) ALL begin with 1979. NONE of them shows any of the data prior to that. It was the short-term 1979-1985 depletion that WAS part of the initial assessment. This also applies to the charts you linked above at “obvious”. They, too, start in 1979 and at ZERO DU. Zero in 1979 was not 300 DU. If you will look again at the data, global ozone was measured at about 300 DU in the mid-60s and it was about 300 DU in 1985. And, it stayed about 300 DU from 1985 to 1990. It’s all there in Table 2 of Herman et al. published in 1991 using the full TOMS database. I gave the complete reference and listed all the DU values in post 74. Everything that I have presented is in the peer-reviewed primary literature. You seem to be denying that these data exist and that they show little or no global depletion through 1990. The word you’re looking for is “stability” — given that you can find the answer for yourself. You could have found that word easily. Seriously, you appear to need so much help with simple questions, your school librarian is the person you should be talking to. She’ll recognize your real need; online we can’t tell you from a troll trying to waste our time retyping material just to waste our time. “… These compounds are practically insoluble in water, and thus are not removed by rainfall. Furthermore, they are inert towards the hydroxyl radical (OH); reaction with this radical to form water is the process that initiates the oxidation of hydrocarbons in the lower atmosphere. That is the CFCs are not removed by the common atmospheric cleansing mechanisms that operate in the lower atmosphere; instead, they rise into the stratosphere, where they are eventually destroyed by the shortwave-length solar ultraviolet radiation (of wavelengths around 200 nm) which is shielded by the ozone layer and by molecular oxygen. Because transport into the stratosphere is very slow, the residence time for the CFCs in the environment is of the order of a century. Hank… I will refrain from responding to your childish ad hominems (trolls etc.) but prefer to point out that you overlooked the critical part of my question: “as opposed to those lacking fluorine”. No question that the data clearly show that CFCs are broken down in the stratosphere. To be sure about that my librarian pointed me to Zander et al. 1992. I cited this source to you at post 62 but you didn’t read your assignment? Their data (30°N, 1985) reveal that below 25 km (where Stolarski et al. 1992 said large ozone decreases had occurred) only 30% of the INORGANIC chlorine came from CFCs while the remaining 70% came from methyl chloride, methyl chloroform and carbon tetrachloride. These three are those lacking fluorine. You’ll have to actually read their paper and do a little work using Table !!,!!! and Fig. 1 to see this but I’m sure you can handle it. In addition, their data show that ClO represents less than 1% of the total chlorine and you’ll also see that of this 0.6% the amount below 25 km is negligible. So, read the paper and report back telling us how, where and why CFCs have anything to do with stratospheric ozone outside of the polar vortex. Where’s your non-polar “smoking gun”? Ken, Hank’s explaining to you why you may look to some like a troll is not an ad hom, because he did not imply that your argument was therefore invalid. You’re bashing away at a dead horse, and seem to be generalizing (invalidly) from the specifics of that argument to the wider ozone question. Most folks are just not going to be all that interested, I’m afraid. I can’t tell if you’re brand new to the subject and really need this much help, or not. I’m an amateur reader here; I can’t retype this field into the thread. Study the current science; understand that science develops over time. Read the basis for the 2007 amendment to the Montreal Protocol, speeding up the removal of ozone-depleting chemicals from commerce. Understand the precautionary principle — it worked here. Or we think so far that it’s working. Close call, story not finished. Assuming you are seriously interested, starting from scratch, and need to learn this — ask your librarian for help. It’s the best way. I’m done; you need more help than I can offer to learn. Best of luck. Ken may be trying to say as though it were new what’s long been obvious, without realizing it is obvious: we rarely know enough, and we do make make policy decisions without full information. Life’s like that. I posted this link earlier re chemistry. From those results, I’d recommend this (some pages available at Google, enough to get an idea of both the atmospheric lifetime and the total ozone depletion potential and global warming potential of a long list of gases studied). Point is that policymakers need to understand what persistence, transport, and total potential activity mean, to weigh the risk involved in chemistry. Deliberate implicit confusion? Disinformation? For other readers, please recall that it was the anti-correlation of chlorine (ClO) with ozone at the inner edge of the Antarctic polar vortex that was used as the “smoking gun” to support the “standard” theory outside of the ozone hole. As I asked Hank, where’s the “smoking gun” for ozone loss by CFC-chlorine at 30° N? Re. “enough disinformation”. Others please note that none of the references that I have presented in the earlier posts has been shown to be “disinformation”. None of their conclusions has been denied. None of the data have been challenged specifically. Where’s the disinformation, the false or inaccurate information? 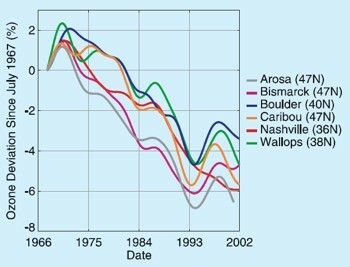 Please note that charts showing the POLAR data go back to the IGY in 1957 (http://ozonewatch.gsfc.nasa.gov/facts/history.html. See also Solomon, 1990, Nature, vol. 347, Fig. 1). The ozone hole charts use the actual, measured ozone values in Dobson units. The global ozone graphs seldom use the actual measured values but rely on percentage deviation anomalies to an unreferenced Dobson base, and they have been adjusted for seasonal, solar, QBO etc. The earlier papers reported the measured values. UV radiation is absorbed by actual ozone as measured, not by adjusted values. Went to that figure. Please look at the TOP panel of Ch. 3, Figure 3.1. There is not a single value that is at or above 300 DU. That is difficult to understand since both Newman and Stolarski authored Ch. 3 and both were authors of the 1991 JGR paper where all but one value in their Table 2 from 1979 to 1990 was at or above 300 DU. Looking back at the TOMS database you’ll see that this TOP figure cannot possibly be correct for the latitudes given. Maybe 50N-50S? It is not my claim, gavin, it is the published data from TOMS combined with the data prior to 1979. Global ozone 300 DU in the mid-60s; 300 DU in the mid 80s. No change. PS. I got my copy of the complete TOMS database from Rich Stolarski as a printout before any of this downloadable. After nearly two decades of decrease, the column amount of ozone at midlatitudes of the Northern and Southern Hemispheres has been relatively stable over the last decade. Polar ozone is considered in more detail in Section 3.2.1.3 below. We can integrate over the globe to get a simple measure of the recent changes in the ozone layer (Figure 3.2). The global mean total column ozone values for 2002-2005 were approximately 3% (about 10 Dobson Units or DU) below 1964-1980 average values. The 2002-2005 values are similar to the 1998-2001 values and this indicates that, overall, ozone is no longer decreasing. Several global datasets confirm this conclusion, although differences of up to 1% between annual averages exist between some individual sets (WMO, 2007). Total column ozone over the tropics (25°S to 25°N) remains essentially unchanged. Total ozone trends in this region for the period 1980-2004 are not statistically significant, consistent with earlier assessments (Figure 3.4, WMO, 2007). Ken, you’re just restating the history as though you were the first to discover it and you’re shocked, shocked. Why don’t you read more of the history? Science doesn’t grow from some perfect original founder; it grows like kudzu, and you can’t cut it off by attacking the first place it began. Science is interesting to the extent it leads to interesting work, even if the original paper is wrong! This one wasn’t, although it wasn’t completely right. No original paper ever has been that I can think of. “… The prophecy aspect of their work turns out to have been enormously important and influential, though to some extent this was serendipitous. The damage to the ozone layer that they had foreseen did not eventuate to nearly the extent that they had expected. A different type of ozone depletion, also chlorine mediated, did! A coupling of the rapid increase in input of CFCs into the lower atmosphere, their virtual indestructibility, and the long lag times before their build-up in the stratosphere, means an inevitable continuing significant increase in stratospheric hydrogen chloride. If chlorine is significantly involved in ozone chemistry, it is very likely that something will change at some stage during this long and inexorable build-up, even if it is not the exact process that was predicted. In practical terms, the fact that Molina and Rowland made this prophecy had two major practical outcomes. Firstly, the work caught the public imagination, and increased public awareness of both the importance and the delicate nature of the earth’s ozone shield. Before long there were significant public and political movements in several countries seeking to limit the use of CFCs. These filtered through to a very high level, so that the negotiations that led to the international agreements to restrict CFC usage were already well under way before the Antarctic ozone hole discovery had been announced. Clearly this meant that the international community was much better placed to take realistic action …. …. when the Antarctic ozone hole announcement was made, a very thorough scientific investigation was immediately triggered. Although the announcement was completely unexpected, and the phenomenon was a complete surprise, the problem of its mechanism was effectively solved within three years, and worked out in fine detail within five years. The overall outcome was that action, both political and scientific, was taken immediately, which actually led to a turn around in chlorine trends within a decade of the ozone hole announcement, and is projected to lead to recovery of a situation where the hole will no longer appear within fifty years. Flawed as the Molina–Rowland prophecy may have been, it was the primary factor in a fortuitous state of affairs. In one sense the Antarctic ozone hole was a phenomenon that came as a complete surprise. But in another sense its discovery actually came in circumstances where we were very well prepared to deal with its implications! For this, we have Molina and Rowland to thank – both for their scientific investigations, and for the fact that they saw the need and were willing to publicise their findings in the broader community and the political domain. The analysis of this episode in recent science highlights some surprising aspects of the value that is placed on prediction in science. In terms of evidential value, the failure of a correctly evinced prediction should normally constitute a Popperian falsification of a theory. But the important question is whether it does so in a way that calls for ‘fine tuning’ of the theory by minor modification and extension, or in a way that calls for its radical overthrow. This is the sort of question addressed by Kuhn and Lakatos in their respective critiques of Popper’s approach. There do not seem to be any practical or realistic suggestions from philosophers of science for its resolution. Often in science, a seemingly clear prediction can be exceedingly difficult to check in practice. In this case, the atmosphere is a very complex system….. I don’t fully understand the relationship between ozone holes and the solar minimum. Now that we appear to be in a Grand Minimum, how hopelessly messed up is the ozone layer going to be? Perhaps the bottom was last August — so it appears right now. Wait a few months before proclaiming something utterly new. Same advice as with any time series where you need enough data to know it’s real. This is a cycle not a trend line, but same issues apply. You’ll probably see claims that cosmic rays should have jumped way up in the past few months — but they didn’t. Lu’s prediction of an ozone layer minimum failed to happen. In the low part of the solar cycle, with less UV, expect less ozone loss; as the solar cycle rampus up there’s more UV and more ozone loss. That was written up for the past cycle; look it up.